Several of Germany’s neighboring countries have issued travel warnings to their citizens who plan weekend trips to the Sachsen region (where Chemnitz, Dresden and Leipzig are located) as rightwing organizations like Pegida and Afd have called for demonstrations over the weekend. Various press reports estimate that several thousand will show up. Several Eastern European nations (Poland, the Czech republic) warned their citizens via newscasts that the Sachsen region runs a risk of rioting over the weekend whilst Switzerland even made an official announcement via it’s state department, advising all Swiss citizens that Germany’s big cities run risk of seeing major demonstrations over the weekend. The Swiss alert read: “Germany: the country is stable. There may be demonstrations in the big cities. Use caution in the vicinity of demonstrations as rioting is possible. Related coverage: <a href="http://thegoldwater.com/news/35567-Germany-Giant-WWII-Graffiti-Pops-Up-In-Berlin-Refugee-Attacked-In-Wismar"> Germany - Giant ‘WWII Graffiti’ Pops Up In Berlin, Refugee Attacked In Wismar</a>. 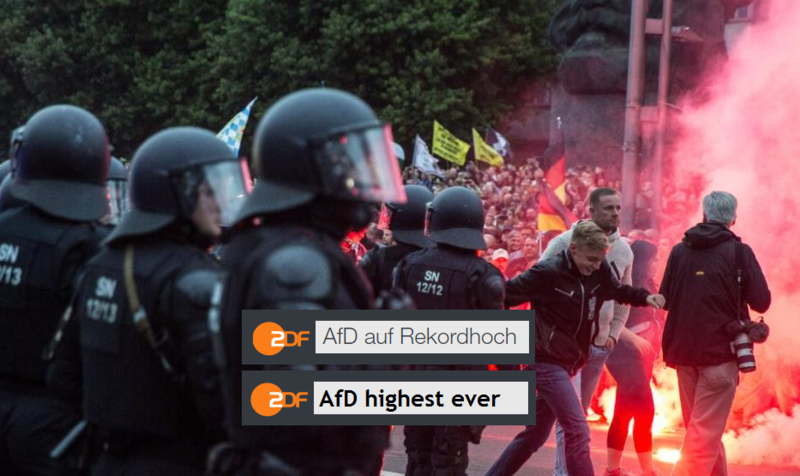 German national broadcaster ZDF held a political poll after the events of this week, asking respondents whether the rightwing demonstrations (and the ‘refugee hunts’) which made worldwide headlines, were a ‘dangerous development’ for the country. 76 percent of Germans saw this as a high or very high risk, meaning that a quarter (23 percent) does not see it that way. By contrast, only 34 percent of AfD supporters (the anti-immigrant party) sees this as a threat whilst a of 65 percent do not see it. Furthermore, the “PolitBarometer” of ZDF which measures the voting intentions of Germans admitted that the anti-immigrant AfD would achieve their best result ever if voting were to be held this weekend and that the coalition government of Chancellor Angela Merkel does not have a working majority anymore. gas them for-real next time! He who was once flesh is spirit now, and indestructible. Rise up Germany, for your people, for our future!! You are our Mother, our leader, and for you we sound our battle cry!